Oh, Junie B. Jones (don’t forget the “B”!). Do you love her because your child enjoys reading, or do you hate her for her annoying behavior and horrid grammar? Personally, I feel neutral. Whether you like Junie or wish you’d never met her, we all need a break. 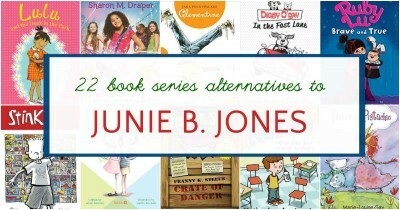 While the series on this list are not necessarily books like Junie B. Jones (in that they don’t all feature sassy girl protagonists with poor grammar) they are all appealing, funny books that kids will like. Princess Pistachio. This is a new series from popular author Marie-Louise Gay. When Pistachio receives a crown from an anonymous source for her birthday, it confirms what she’s known all along: that she is a real princess! However, her opinion of princess duties is at odds with what her parents feel her duties are. In addition, her little sister is soooo annoying, until — that is — she’s not. 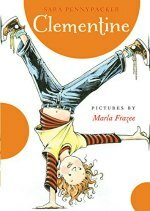 This is a lovely, gentle chapter book about a spunky girl who is generous at heart. Clementine. Clementine might be my favorite 21sh century heroine. She’s super-spunky and determined to enjoy life despite constantly getting into scrapes. She’s been compared to Ramona many times, but I think I like her even better. MORE: For tons more great funny early chapter books, this list of 100 funny chapter books has tons of suggestions! Katie Kazoo, Switcheroo. There are, to date, 35 Katie Kazoo books. So, if your child likes them, they will be reading for a while. I can’t say I’ve read all 35, but I’ve read a few. Katie is a third grader who has a knack for switching places with other people, past and present. It actually would have been a good book for my Alternatives to Magic Tree House list, I can’t believe I didn’t think of it! Ivy & Bean. Bean and Ivy are best friends with highly creative imaginations and a flair for inventing complicated games and finding convoluted solutions to problems. Both girls are intensely likable and their adventures will have your kids in stitches. Don’t miss these books; large font, illustrations and short chapters make them a high quality chose for beginners (and grown-ups like me). Judy Moody. Judy is a likeable character who has real feelings and moods that kids will readily recognize. Fortunately for readers, the imaginative, clever Judy finds creative and humorous ways to always make the best of her situations. Sassy.Fourth grader Sassy is annoyed that her family calls her “Little Sister”. In fact, she doesn’t like much that comes with being the youngest child. She is determined to change things and the contents of her sparkly handbag that her grandmother gave her come in handy on that quest. Kids will like this one and I say it’s definitely worth a better cover! Dory Fantasmagory had my son in stitches as we were reading it. Dory is a highly imaginative 6 year old. Her older brother and sister invent the Mrs. Gobble Gracker in order to scare Dory into “not behaving like a baby,” but Dory grabs onto the idea and her imagination runs away. It’s hard to describe the whole intricate plot here, but the way Dory’s imaginary world and real world overlap is hilarious. We also just read the second book, Dory and the Real True Friend, and it’s just as great as the first. Heidi Heckelbeck Has a Secret. Heidi comes complete with a glitter-covered cover. Don’t let that put you off. Heidi, home-schooled until now, is starting second grade. Her discovery that she is a witch doesn’t come until the end of the book, which means your child will demand, “Next book, please!” And that is always a good thing. The large font and illustration-heavy pages make this series a good choice for emergent readers who want to feel like they are reading “real” chapter books but may still not be ready for some of the others on this list. Digby O’Day in the Fast Lane. Canine best friends, Digby and Percy enter a race which proves to be more of a twist-y turn-y adventure than they expected. With a nod to the tortoise and the hare fable, this is a book full of great fun and humor. It also makes a great read aloud. Nancy Clancy, Super Sleuth. The Fancy Nancy franchise is branching out into early chapter books. This one is stereotypically aimed at a female audience (sigh); nevertheless, many kids will enjoy it and Nancy is certainly an appealing character. Stink: The Incredible Shrinking Kid. The younger brother of popular series girl, Judy Moody, has an unfortunate nickname. He’s also short and tired of being bossed around by his older sister. Kiddo’s favorite was #4: Stink and the Great Guinea Pig Express; while he read it he could not stop laughing. A kid who finds reading fun is a kid who will read more. Roscoe Riley Rules. Roscoe Riley was one of Kiddo’s favorite series when he first began reading chapter books. Notably it was written by this year’s Newbery winner! I think sometimes parents write off books (esp. those about boys) that have cartoon-like covers and silly subtitles such as “Never Glue Your Friends to Chairs” as fluff. But this is a serious mistake; Roscoe is a charming, well-intentioned kid, who just happens to have a lot to learn about solving problems. And don’t we all? Princess Posey. Confession time: I expected not to like this series for the simple reason that it has glitter on the cover. In my opinion, glitter on the cover is a book publishing marketing ploy based on a girly-girl culture for which I have a particular revulsion. However, never judge a book by the cover. In each book, first-grader Princess Posey, who has a “security tutu,” discovers the strength within her to face down her fears. I’ve found the age of the protagonist is a good indication of reading level, making this a good first chapter book after when transitioning out of easy reader books. Appleville Elementary. This four-book collection covers a single school year in a first grade classroom. Nancy Krulik (who also wrote Katie Kazoo) has written a number of series, and this one is good for the earliest chapter book readers. These were some of Kiddo’s first independently read chapter books; he read them all repeatedly and you can’t argue with that! Nate the Great. This classic series is a very, very, early chapter book (it’s actually in the early reader section of our library) so it’s good for younger kids. There are a ton of books in the series to satisfy your kids and keep them reading should they take a liking to good ol’ Nate. 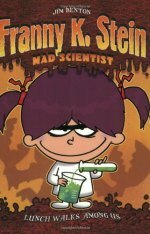 Franny K. Stein, Mad Scientist. Franny is a young mad scientist (yes, for real!) but I love how her problems are that of a normal kid. She just wants to fit in with the other kids at school. Since she is a scientist she makes observations about what the other kids are doing (playing with dolls, dressing “cute”) and eating (squishy white bread sandwiches instead of pumpkin ravioli) and then conducts experiments to see how best she can adapt. It turns out, however, that her uniqueness is what helps her be accepted and appreciated by her classmates. This very clever series is lots of fun for both boys and girls. Ruby Lu, Brave and True. There aren’t a lot of children’s books featuring Asian-American heroines, so the ebullient Ruby Lu is a welcome addition to the field. Ruby Lu’s Chinese heritage is an important part of the stories, especially when her cousin, Flying Duck comes to stay. I love the fun little flip book built into the first book as well as Ruby’s unique way of describing the world around her. Lulu and the Duck in the Park. Previously published in the UK, this new-to-the-US series by established author Hilary McKay, has received good reviews. I really loved this sweet and funny story about Lulu, an animal lover who, unable to leave an abandoned duck egg in the park, hides it under her sweater and brings it to school. Nikki and Deja. Karen English’s lovely series about two friends was a Bank Street College of Education Best Children’s Book of the Year. It’s funny, sweet, and all girls who have a BFF will be able to relate to Nikki and Deja’s friendship and the lessons they learn. Gloria’s Way. Julian’s neighbor, Gloria, has a few books of her own. The short stories they contain follow the typical story lines about school and family. They are well-written, charming and I particularly like the emphasis on the relationship between the parents and their children. Bad Kitty Gets a Bath. This is a popular series and I never thought I would like it until I actually read it and laughed quite a few times. It’s garnered all sorts of praise from professionals. It’s heavy on the illustrations, making it a good choice for reluctant readers and includes lots of facts woven into the text, which will appeal to non-fiction lovers. Don’t miss any of our Monday book lists (and other activity ideas). Sign up for the newsletter. Violet Mackerel- she’s quirky and thoughtful, a different kind of heroine. I love that her books each have a good message, but it’s not heavy handed. The Critter Club series- my daughter loves these. They’re about a group of girls, with different books in the series focusing in on different characters. These are simple easy chapter books, but not the poor writing that you often find in those kinds of books. And again, each book often has a positive message, but they don’t beat you over the head with it! Daisy Dawson and Marty McGuire are both active, outdoorsy female characters. Lots of fun! Violet, Daisy and Marty are wonderful. They are on my lists of early chapter books featuring girls – it was so hard to narrow this list down so I know that I left some good ones off! I’ve heard some great things about The Critter Club, but haven’t had time to pick up a copy and check it out myself — I’l have to do so now, so I can put it on a future list. Thanks! Thanks for another great list! Thank you for the suggestions! Thank you for making comments like large type, lots of pictures. Those are the main criteria I use while rifling through the series books at the library. This list is a great help. Princess Posey and Ivy+Bean were soundly rejected at my house, but I’ll try Bad Kitty, much as the title puts me off. I will also look into some of the other reader suggestions. I would also try The Princess in Black by Shannon Hale and Sophie the Mouse, which is a new series. Also, The Critter Club has been recommended by others and fits your criteria. Literally LOLed at this post. My daughter and I both laugh at Junie B. but her grammar drives me CRAZY so it’s a guilty pleasure. And she’s not reading yet, so I struggle with how to read the bad grammar – go with it or sneakily fix it? (I do both.) Looking forward to checking out this list. We’ve done only the Nancy ones so far. I hope you enjoy the books! Happy reading! Is it okay to confess that I laugh at the Junie B. Jones books too? lol! But it’s always good to have alternatives. My daughter loves funny stories. We’ll have to check some of these out! It’s totally okay to love Junie! We read a few Junie B. Jones books, but they weren’t very engaging for my six year old. We’ve been reading Magic Tree House, A to Z Mysteries, Mercy Watson, and Cam Jansen. I hear the sentiments about Junie B. Jones all the time at my library. 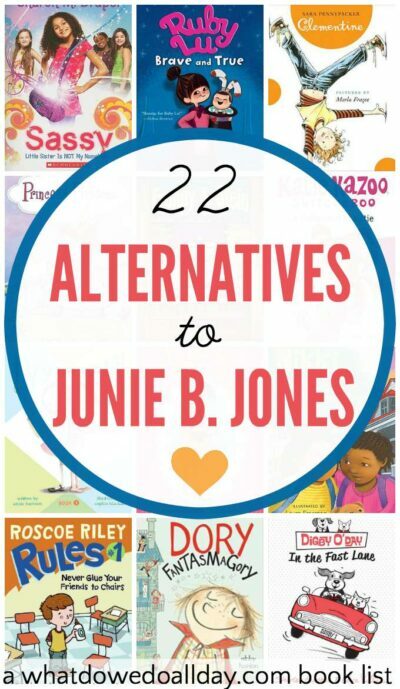 I like this list a lot and have two others that I have read and enjoyed — Ruby and the Booker Boys series by Derrick Barnes and Willimena Rules! series by Valerie Wilson Wesley. Thank you for the suggestions! I always love to hear from librarians! I know I wrote them, but if sassy girls or bad kitty is putting you off try my Kylie Jean series. Strong family values, plenty of animals and adventures too! I read Kyle Jean Blueberry Queen and really enjoyed it! I am a librarian for a PreK-3rd grade school library and my students LOVE the Kylie Jean series! We started with the first four a few years ago (as an experiment to see how they would go over) when Capstone first started selling them and now we have the entire series and will buy every additional one as it comes out.